A rally with exactly 40 points of potential — equivalent to about 320 Dow points — looms if the futures are going to fulfill the 2512.00 Hidden Pivot target shown. 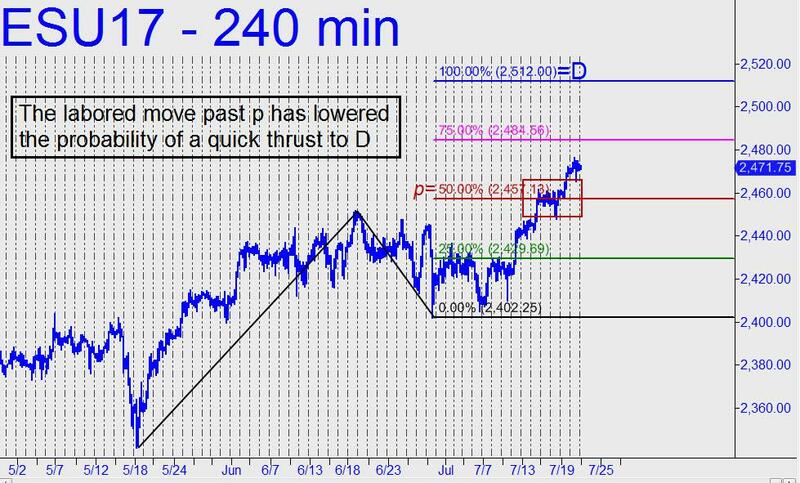 However, the move through the midpoint pivot at 2457 was labored, implying that a quick ascent to 2512.00 is somewhat unlikely. Accordingly, we should be ready for a ‘surprise’ reversal, which would begin to look menacing if it exceeds 2448.00 to the downside.